The Surtees Property is a four acre site located at 4629 Lakeshore Road that was originally acquired in 2002 to facilitate the construction of a future trail head for the Bellevue Creek Greenway. The property is intended to act as a key link in a future public recreation trail from Okanagan Lake to the city limits at Myra-Bellevue Provincial Park; as such, future park components of the property are anticipated to include a public parking lot and staging area for park users with the trail heading east, to the City limits at Myra-Bellevue Provincial Park, and west, towards Cascia Linear Park and Okanagan Lake. Acquisition of the Surtees Property included two buildings of significant historical value, both of which visually represent Kelowna in the early part of the 1900’s and are identified as such on the City’s Heritage Register. 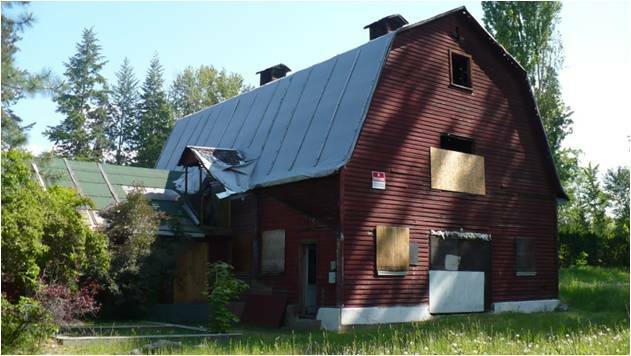 The Surtees Barn, originally constructed as a dairy barn circa 1927, is said to be one of the most up-to-date barns in the area for its time, and the Surtees Homestead (also known as the Ritz Cafe), constructed circa 1912, is linked to the building of the Kettle Valley Railway. In 2015, the Surtees Barn and Surtees Homestead buildings were included in the City’s work plan for Heritage Asset Restoration to explore potential restoration programs for the property and the City’s other heritage assets of significance (notably the Cameron House and the Brent’s Mill Heritage Park buildings). Adaptive re-use is the process of reusing an old site or building for a purpose other than which it was built or designed for. The goal of adaptive re-use of the Surtees Property would be rehabilitation of the existing buildings and protection of the character of the site in a fashion that showcases - and celebrates - its heritage value. The other goal would be to transform the site in a way that blends the adaptive re-use of the buildings with the surrounding park and strengthen the public connection to the Bellevue Creek linear trail through strong visual wayfinding elements and a public trail network nestled amongst the historic buildings and mature trees. Given competing community priorities and limited taxation funding to continue to preserve the failing buildings, the Surtees Property was identified as a priority for adaptive re-use in 2009. Based on the information received, a Request for Expressions of Interest (“RFEOI”) was issued in 2012 to look for financially viable proposals to preserve and maintain the site in a self-sustaining manner. The City received four responses; however, it was determined that none of them met the City’s criteria or expectations. In December 2016, a partnership opportunity with Worman Commercial was approved by Council. The goal of the partnership is to work towards restoration of the Surtees property by rehabilitating the existing buildings and protecting the character of the site in a fashion that showcases its heritage and park value.